This title was first published in 2001: Family centre practice is one of the success stories of the past twenty years. As well as contributing creative ideas to centre practice this important edited collection highlights the role of practitioners as developmental or informal educationalists. International contributors challenge care management in child protection as the dominant discourse in child care social work and instead advance integrated practice in the internationally developing role of family centres as a more authentic and hopeful practice for children and families. The contributors outline ways of avoiding reductionism - social work reduced to a protective and assessment role - and show how socially inclusive practice can be sustained with very marginalized families. 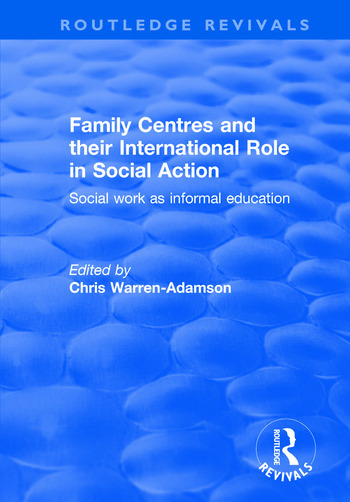 The book argues that there is a need for the social work training curriculum to emphasize social work's debt to social and informal education, and concludes with a call for an international forum of family centre practice. Contents: Introduction: family centres, integrating practice, and empowerment journeys, Chris Warren-Adamson; The family centre and the consolidation of integrated practice, Chris Stones; What’s happening in France? the settlement and social action centre. Exchange as empowerment, Chris Warren-Adamson with Anne-Marie David and Jean-Paul Ducandas; Education and empowerment in family centres, Paul Montgomery and Claire Cook; Francophone centres in Québec, Canada - two case studies, Irene Kyle and Maureen Kellerman with Alla Ivask; The referral only centre - managing changing attitudes to parenting, Audrey Fessler; The office as centre. A ’patch’ approach, supporting and protecting in two Massachusetts communities, John Zalenski and Carolyn Burns; Justice, child protection and family centres, part 1(inside), Ellen Jones and Dave Ely; Justice, child protection and family centres, part 2 (outside), Terri Fletcher and Mo Romano; Aotearoa/ New Zealand - family centered practice from a mental health perspective, Lynne Briggs; Aotearoa/ New Zealand - working differently with communities and families, Robyn Munford and Jackie Sanders, with Ann Andrew, Peter Butler, Ripeka Kaipuke, Leland Ruwhiu; Contemporary debates in centre practice in youth justice and community development, Andy Lloyd and Nick Frost; User participation in family centres in Greece, Vasso Gabrilidou, Elpida Ioannidou and Evi Hatzivarnava; Make your experience count: social work as informal education, Di Holland; The neighbourhood family centre as a base for life-long learning, Joy Adamson with members of Togher family centre, Ireland; Conclusion - lessons from family centres: the authentic site for ecological practice, Chris Warren-Adamson.